three profiles were found for Cepa.aero in social networks. Among other social networks the website is represented in Facebook, LinkedIn and YouTube. The web server used by Cepa.aero is run by HOSTING90 systems s.r.o. and located in Czech Republic. This web server runs 1 other websites, their language is mostly english. 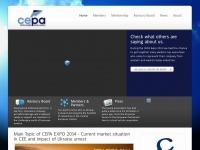 A Nginx server hosts the websites of Cepa.aero. For managing the data of the webpages the CMS WordPress in the version 4.1.4 is used. XHTML 1.0 Strict is used as markup language on the webpages. To analyze the visitors, the websites uses the analysis software Google Analytics. Indexing the data of the website and following hyperlinks on it is explicitly allowed by robot information.